Ehrharta longiflora was not found in California at the time of the Jepson Manual, and hence is not keyed or referenced there. Claire Brey found it in Torrey Pines State Park in the mid-1990s, and unfortunately it was not eradicated at once. This is not surprising; no one knows when a given species will become invasive or not, and a new species for the state is always an interesting novelty. Unfortunately, the infestation quickly spread through Torrey Pines on all the trails, and it began to take over undisturbed north-facing slopes and under trees. Beginning in around 2001, docents and other volunteers began a program of eradication, using herbicides to kill large patches and hand labor to remove individual occurrences. The difference was quite noticeable by 2003; native plants that had been crowded out by the Ehrharta began to reappear. See Torreyana, May 2003. However, eradication is far from complete. In 2003, Mike Kelly was given a contract to control the Ehrharta. He used a grass-specific herbicide, Fusilade II, which the Park previously tested. The flower show at Torrey Pines was wonderful in 2005 after two more years of Ehrharta control. 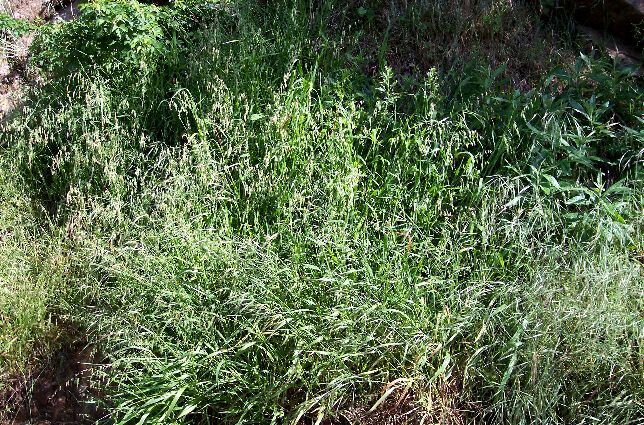 It is a shame that the state of California or the federal government did not immediately assist in the prompt eradication of this noxious weed before it spread elsewhere. Mike Kelly reports that E. longiflora is spreading north along I-5 in the Caltrans right-of-way since around 2003, and that a ranger at San Elijo Lagoon is tracking it and trying to control it there. Jon Rebman reports that he has been documenting E. longiflora in Crestridge Ecological Reserve, east of El Cajon, for the last couple of years, since around 2003. He has found three populations there: one is probably about 10 plants; another is about 20 plants; and the largest one is probably over 100 plants. On 4/15/05, as part of routine botanical work on one of my plant trail guides, I discovered that E. longiflora has now spread to southwest Riverside County, 39 air miles almost due north. I found over 1,000 plants growing in Temecula Gorge inside the Santa Margarita Ecological Reserve (SMER) in three patches growing within ~200 feet of each other. 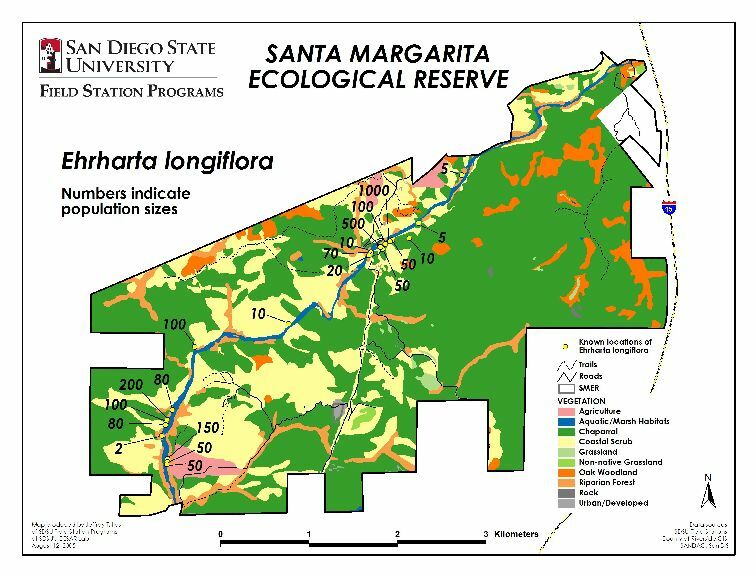 Mark VanScoy, assisted in part by a volunteer, subsequently surveyed the entire length of the section of the Santa Margarita River within the boundaries of SMER on 13 and 16 May 2005. Mark's survey was done at the optimal time for spotting this species, when it was just beginning to drop its seeds and hence most visible. The following map of the infestation along the River was made by Jeffrey T. Isles of the San Diego State University's (SDSU) Field Station Programs at SDSU's CESAR Lab. The E. longiflora locations are given by small yellow circles, each of which has the estimated number of plants of E. longiflora at that location. This map is reproduced here with permission from SMER, and is scaled down by 25% from its original size. For orientation, in the map, I-15 is shown along the eastern edge of SMER. The southern limits of the city of Temecula in Riverside County begin along I-15 approximately at the northeast boundary of SMER. Fallbrook, in San Diego County, is located at the southwest boundary of SMER. Unfortunately, Mark's survey revealed a very extensive spread of this noxious weed, extending downstream to the farthest point he surveyed. There may be populations extending all the way downstream to the mouth of the River. Interestingly, the spread upstream was quite limited. It was introduced by an educational class or scientific researchers that visited SMER after visiting Torrey Pines, which stayed at the North Field Station, sometime around 2003 or earlier. SMER has records of such classes that visited Torrey Pines before coming directly to SMER. An initial population of a small number of plants grew originally along the main road of SMER, in Temecula Gorge directly below the North Field Station. This is the discovery location, and the location with the largest number of plants, the three nearby patches of 1,000, 100 and 500 plants shown in the map above. The population at that location grew to at least several hundred plants, producing many thousands of seeds, by the end of 2004, with a limited spread of a small number of plants both up and down river from animals. The extensive flooding of the Santa Margarita River in January 2005 spread a large number of seeds downstream, accounting for the populations extending more than 3 km downstream. Of course, this is just a hypothesis, and could easily be wrong. 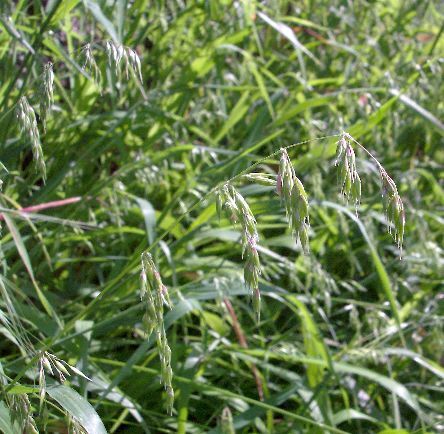 It is probably impossible to prove definitively how this grass was introduced to SMER. 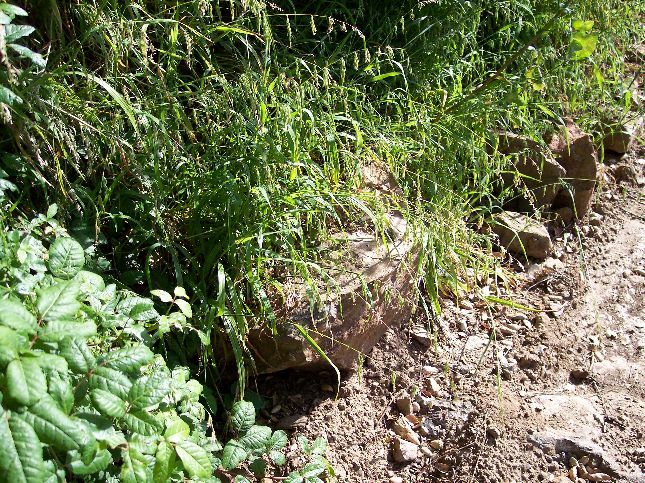 This inland habitat along the Santa Margarita River is quite different from the close coastal location of Torrey Pines, and unfortunately indicates that these species may spread much more widely in cismontane Southern California. This is similar to the situation in Australia, where the habitat is offshore islands, coastal dunes and sandy soils, and inland along disturbed creeklines and grazed woodlands in the western wheatbelt. The rest of this page gives pictures of the infestation at SMER, as well as information on how to confirm its identification for botanists. All of these pictures were taken at the Santa Margarita Ecological Reserve on 4/20/05. A typical inflorescence (flowering stalk). Also note the wide leaf blade. Warning: This section is only for botanists familiar with keying out grasses. Others should consult the Cal-IPC page on Ehrharta. 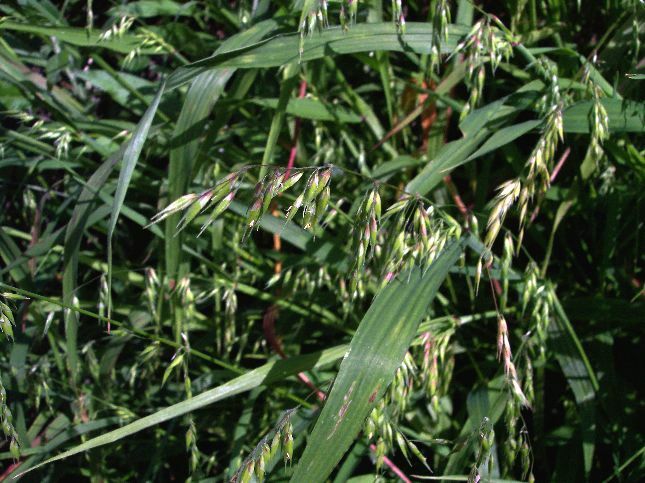 The three genera are Anthoxanthum, Ehrharta, and Hierochloe. Anthoxanthum and Hierochloe are not known to occur in Southern California, and their inflorescences look quite different from that of Ehrharta. 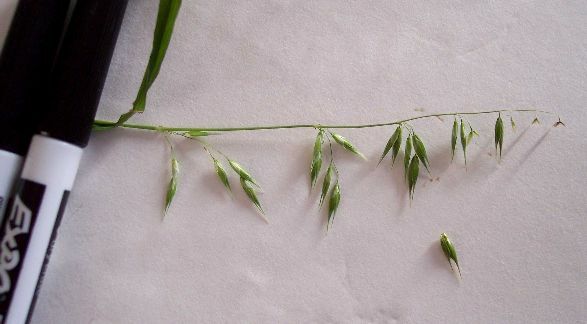 In addition, Anthoxanthum has glumes longer than the florets, and Hierochloe has staminate sterile florets, unlike the empty sterile florets of Ehrharta. There are three Ehrharta species found in Southern California. E. longiflora can be easily separated from these two since it is an annual, whereas the other two are perennials, and by its glumes being significantly shorter than its sterile florets, whereas the other two have glumes longer than the sterile florets. The spikelet of E. longiflora consists of a lower glume 3.0-3.5 mm long and an upper glume 4.0-4.5 mm long; two awned sterile lemmas 6-13 mm long, with awns of 2-20 mm; and an uppermost fertile lemma found inside the uppermost sterile lemma. 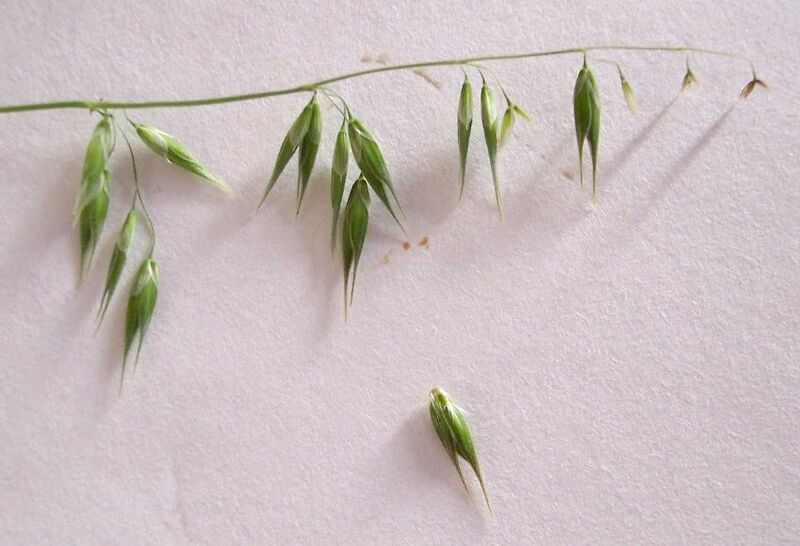 The spikelet axis breaks above the glumes. 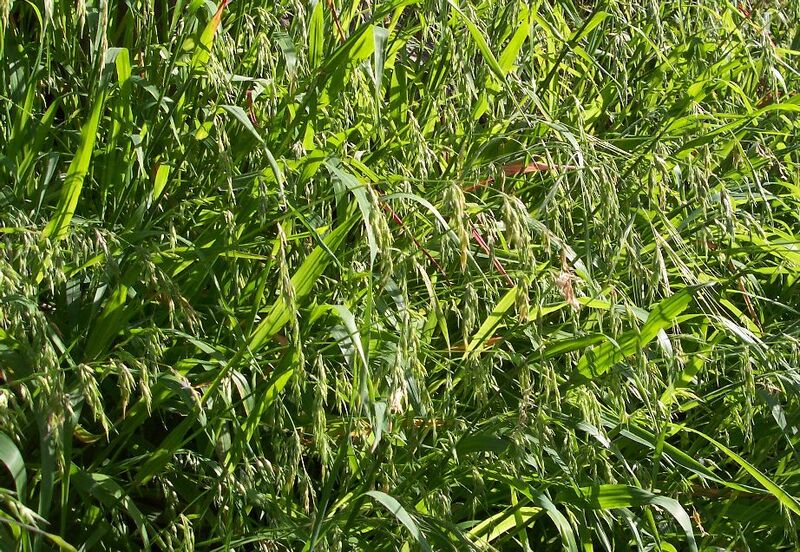 For a complete description of this, or any grass species of the world, download the World Grasses Database along with the DELTA program INTKEY and install it on your PC.